We run a fishing lake in france when a customer requests baits and submitts the form we need it to go to 2 email addresses how can wqe do this? Yes, that is possible by using Conditions. 2.1 Under "If", select the field that you wish to use for your conditional email notification. 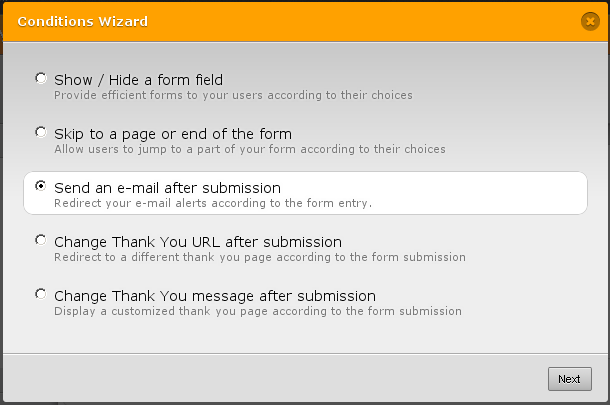 2.4 On the "Then send" field, select the name of your email notification that you wish to use. 2.5 On the email to field, enter the email address that the notification will send to. Do the same process for every email address that you wish to receive a notification email. You can also read more about Conditional Logic on forms on this link. Glad to know that our support team was able to help you. Let us know if you have other concerns. Thank you. Can you place multiple email addresses under conditions? You should be able to set up multiple email addresses for conditions involving email notifications. We hope you find this information useful. Please follow the above steps and let us know if you need further assistance.